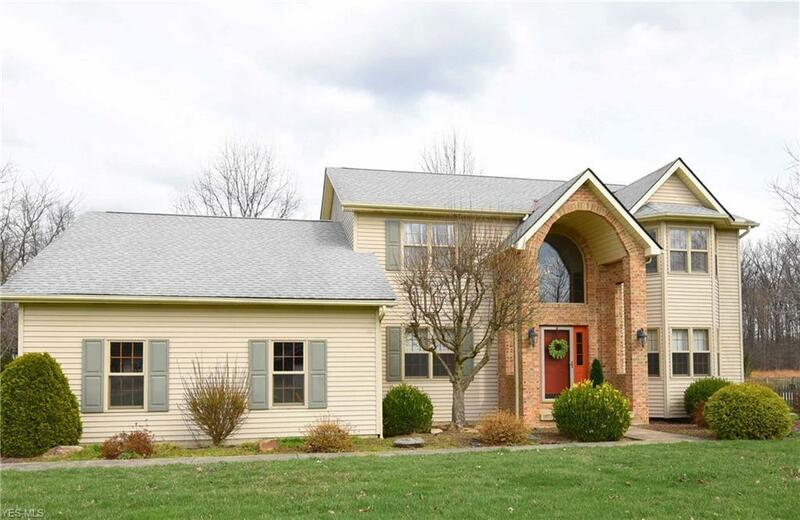 Be impressed as you drive up to this stately two story colonial with inviting curb appeal! Located on sought after Robson Road, 1.61 acres. Beautiful tree-lined road. Entering the 2 story foyer, living room right of center stairway with bay window, 2 corner cabinets, 2 accent wall lights & oak floor. Left of the stairs see French doors opening to the office & lovely cherry wood floor. Better Home & Gardens beautiful huge custom updated kitchen with quality white cabinetry, lots of granite counters, stainless steel appliances, farm sink, 5 burner gas range with custom designed overhead fan, electric convection oven, also antique color smoked glass china cabinet & a warming drawer. You can be cooking and look to the FANTASTIC GREAT ROOM with vaulted ceiling, skylights, cozy brick fireplace & the gorgeous cherry hardwood floor. A sliding patio door in dinette goes out on pentagon shaped deck. Enjoy deer and wild turkeys on 26'x18' paver patio under the pagoda. Master bedroom is 21'x13' and has a bay window. Master bath has a shower and his & hers separate sinks with granite counters, ceramic/glass tile, white storage cabinets and walk-in closet with built-in shelving. 3 bedrooms & main bath also upstairs. 1st floor laundry with white cabinets & counter to fold clothes. Walk-in pantry. Detached 2 car garage, w/attached 2 story workshop; main floor heated. 2750 sq. ft. concrete floor, 200 amp box, tongue & groove poplar siding. Structure is built with 2x6 poplar studs & oak joists.